Intramedullary spinal cord tumors, like the one depicted in the image below, refer to a subgroup of intradural spinal tumors that arise from cells within the spinal cord, as opposed to adjacent structures such as the nerve roots or meninges. They are much less common than brain tumors and are thought to account for only 2-4% of all intrinsic tumors of the central nervous system. Their most common initial symptom is generalized back pain, which is very difficult to distinguish clinically from back pain from musculoskeletal conditions. View of a cervical intramedullary ependymoma in situ after midline myelotomy and initial dissection (top left). The tumor was removed en bloc (right), and the postsurgical cavity in the spinal cord is shown (bottom left). Patients are often diagnosed only after the development of neurologic signs and symptoms that may occur later in the course of the disease. Early diagnosis is important, however, because surgical removal for most tumors is curative, and surgical results are optimized when tumors are smaller. Also, neurological deficits resulting from intramedullary spinal cord tumors are seldom reversible. As such, functional outcomes after surgery are closely tied to the patient's preoperative neurologic condition. In 1887, Horsley performed the first successful removal of an intradural tumor. In 1907, Elsberg performed the first successful removal of an intramedullary tumor and subsequently published the seminal publication on spinal tumors. He developed a two-stage operation in which a myelotomy was performed and the dura was closed in the first stage. 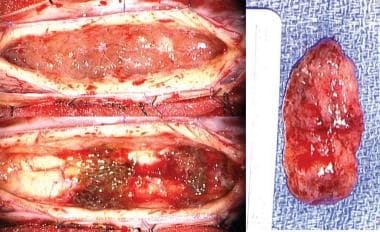 In the second stage, the tumor had partially extruded from the spinal cord for easier resection. In 1919, Dandy introduced air-contrast myelography. In 1940, Greenwald introduced bipolar coagulation. In 1964, Kurze introduced the operating microscope. In 1967, Greenwood published a large series detailing successfully removed tumors. In 1990, McCormick published a large surgical series demonstrating excellent long-term outcomes for surgery of ependymomas and established a clinical grading system. Intramedullary spinal cord tumors are tumors that occur inside the spinal cord. They are relatively rare, compared with brain tumors, but still affect thousands of patients every year. They are generally slow growing, histologically benign tumors and are often definitely treated with surgery. Spinal tumors occur with an incidence of 1.1 case per 100,000 persons. Intramedullary spinal tumors comprise approximately 2-4% of all CNS neoplasms. The most common kinds of intramedullary tumors are ependymomas, astrocytomas, and hemangioblastomas. In adults, ependymomas are the most common tumor type, accounting for 40-60% of all intramedullary spinal tumors, with the mean age of presentation being 35-40 years. In children, astrocytomas are the most common tumor type, accounting for around 60% of all intramedullary spinal tumors, and the mean age of presentation is 5-10 years. The etiology of intramedullary spinal tumors remains obscure but undoubtedly varies according to histology. Most intramedullary spinal cord tumors are considered to be glial in origin because they are histologically and immunohistochemically similar to differentiated non-neuronal cell types, such as ependymal cells and astrocytes, which occur in nonpathological spinal cord tissue. The traditional thinking is that tumors occur when these differentiated cells, which normally stop propagating after spinal cord development, acquire mutations that cause them to divide again in an uncontrolled fashion. Individuals with type I and type II neurofibromatosis (NF1 and NF2) have been recognized for some time as having an increased incidence of intramedullary spinal tumors, as well many other kinds of tumors, compared with the general population. This general predisposition to tumors has been linked to germline mutations in 2 different genes named for their associated diseases. Patients with the NF1 gene are predisposed to spinal astrocytomas, whereas patients with the NF2 gene are predisposed to spinal ependymomas. Relatively recent genetic analyses of spinal ependymomas from individuals without syndromic neurofibromatosis have shown somatic mutations in the NF2 gene in a subset of cases. The identification of mitotically active neural stem cells and neural progenitor cells throughout the central nervous system has altered current thinking about how all intrinsic CNS tumors arise. Many lines of evidence point toward neural stem cells as the cells of origin in brain tumors. This line of inquiry is not nearly as advanced in the spinal cord, but some preliminary work has shown similarities between tumor cells from spinal ependymomas and neural stem cells from the spinal cord. The other relatively common type of intramedullary spinal tumor is hemangioblastoma. Hemangioblastomas are thought to arise from red blood cell precursors and are not intrinsic spinal cord tumors, but they are often anatomically intramedullary because of their association with the blood vessels that penetrate and nourish the spinal cord. Hemangioblastomas occur as a result of mutations in a tumor suppressor gene called vhl, which was found to be altered in patients with the neurocutaneous disorder von Hippel-Lindau disease (VHL). Patients are predisposed to form hemangioblastomas in the brain and spinal cord, and somatic mutations in the in the vhl gene have been found in tumors from patients without syndromic VHL. The pathophysiology of intramedullary spinal cord tumors varies according to tumor type. Ependymomas are usually indolent, encapsulated tumors that are histologically benign. Pain and neurologic deficits arise as a result of a progressive stretching and distortion of nerve fibers. Usually a clear anatomical plane is present at surgery, and a gross visual anatomic resection results in a cure. Rare anaplastic subtypes can be invasive, however, and are more likely to recur or spread through CSF spaces. Even histologically benign–appearing spinal ependymomas can metastasize in this way. Although malignant forms do exist, most spinal astrocytomas are low grade (WHO grade II) and less aggressive than astrocytomas in the brain. Pain and neurologic defects arise from a combination of nerve fiber stretching and from invasion of cord parenchyma. Because they are infiltrative tumors, complete surgical removal without damage to functional tissue is usually not possible. Exceptions to this general rule may include some pilocytic astrocytomas of the spinal cord (WHO grade I) that are more common in children. Hemangioblastomas are highly vascular tumors with capillaries that display an increased permeability thought to be related to a hypersensitivity to vascular endothelial growth factor (VEGF). Lesions usually become symptomatic because this capillary hyperpermeability leads to fluid collections or syringes, which are often larger than the tumor itself, causing mass effect in addition to stretching of neural pathways. These fluid spaces are not lined with tumor cells, however, and only the tumor nidus needs to be removed at surgery. The clinical features of intramedullary spinal cord tumors are variable. Symptoms are not specific to spinal cord tumors and may be present in any myelopathic process. Because of the slow-growing nature of many of these tumors, symptoms precede diagnosis an average of 2 years. Patients with malignant or metastatic spinal cord tumors present in the range of several weeks to a few months after symptoms develop. Pain and weakness are the most common presenting symptoms of intramedullary spinal cord tumors. Pain is often the earliest symptom, classically occurring at night when the patient is supine. The pain is typically local over the level of the tumor but may radiate. Progressive weakness may occur in the arms (cervical tumors) or legs (cervical, thoracic, conus tumors). Impaired bowel, bladder, or sexual function often occurs early. Patients may have poor balance. Rarely, symptoms of subarachnoid hemorrhage may be present. Intratumoral hemorrhage can cause an abrupt deterioration, a presentation most often associated with ependymomas. Examination may reveal a combination of upper and lower motor neuron signs. Lower motor signs may be at the level of the lesion and may aid in localization. Other signs evident upon physical examination may include spine tenderness, stiffening of gait, trophic changes of extremity, sensory loss, hyperreflexia, clonus, and scoliosis or torticollis (generally in children). The first-line treatment for intramedullary tumors is open surgical resection. Surgery is indicated for all symptomatic lesions. Small asymptomatic lesions may be followed clinically and radiographically because the majority of intramedullary tumors are relatively benign and slow growing. However, this approach carries the risk of the development of neurological deficits that are likely not recoverable and the uncertainty that comes with undetermined diagnosis. At surgery, aggressiveness with respect to resection depends on the histological diagnosis of a frozen section and the ability to find and maintain a surgical plane. Given the difficulty in determining many ependymomas from astrocytomas on frozen section, the presence or absence of a clear surgical plane is usually the key determining factor in defining the surgical goal. If, after analysis of all available data including imaging characteristics, frozen section, and intraoperative appearance, a diagnosis of ependymoma is perceived, a complete surgical resection should be attempted. If a diagnosis of astrocytoma is perceived, most clinicians advocate a more limited debulking of only the tissue that is clearly abnormal. External beam radiation is generally reserved for disseminated ependymomas and infiltrative astrocytomas but remains an option whenever radiographic residual or recurrent ependymoma is found. Stereotactic radiosurgery for intramedullary tumors remains untested. The spinal cord originates at the foramen magnum and extends to the conus medullaris, which terminates at the L1-L2 vertebral body junction in adults. The pia matter condenses caudally to this area, extending to the sacrum as the filum terminale. It is an ovoid structure, most narrow in the anterior-posterior direction. At every vertebral level paired ventral and dorsal nerve roots exit the lateral aspect of the cord and coalesce to form 31 pairs of spinal nerves. In contrast to the brain, the white matter of the spinal cord surrounds the interior gray matter. The spinal cord is covered by a supporting connective tissue layer called the pia matter that acts as a trellis for the vascular supply. A vestigial extension of the ventricular system, the central canal runs the length of the spinal cord. Dilation of the central canal may be pathologic in some instances. In general, ventral portion of the spinal cord parenchyma subserves motor function, whereas the dorsal portion subserves sensation. The spinal cord contains the same cell types as the brain, but these are highly specialized to their niche in the spinal cord. The vascular supply for the spinal cord comes from the anterior spinal artery, the paired posterior spinal arteries, and the 31 radicular arteries. The anterior and posterior spinal arteries form off branches of the vertebral arteries at the cervicomedullary junction and course inferiorly along the length of the spinal cord. The anterior spinal artery is relatively constant and runs in the middle of the ventral surface of the cord, sending deep penetrating branches into the anterior median sulcus. These branches then send arterial twigs radially to the deepest portions of the spinal cord. The paired posterior spinal arteries are relatively inconstant, course along the posterolateral surface of the cord, medial to the dorsal root entry zones, and send short penetrating end arterioles into the dorsal cord parenchyma. Thus, the anterior spinal artery supplies the ventral two thirds of the cord, whereas the posterior spinal artery supplies the dorsal third. The spinal arteries form the nexus of an arterial network that is replenished by the radicular arteries that enter the spinal canal through the spinal nerve root sleeves. The radicular supply to the spinal cord is highly variable, but a few vital feeding arteries are usually present. The most important of these is the artery of Adamkiewicz, which is usually found on the left side, from T9 to L2. Absolute contraindications to surgical intervention include uncorrected coagulopathy and systemic infection. Relative contraindications to surgical intervention include complete neurologic deficit over 24 hours and short life expectancy. Boström A, Kanther NC, Grote A, Boström J. Management and outcome in adult intramedullary spinal cord tumours: a 20-year single institution experience. BMC Res Notes. 2014 Dec 15. 7:908. [Medline]. [Full Text]. Klekamp J. Treatment of intramedullary tumors: analysis of surgical morbidity and long-term results. J Neurosurg Spine. 2013 Jul. 19(1):12-26. [Medline]. Zielinski P, Gendek R, Paczkowski D, Harat M, Dziegiel K, Sokal P. Results of intraoperative neurophysiological monitoring in spinal canal surgery. Neurol Neurochir Pol. 2013 Jan-Feb. 47(1):27-31. [Medline]. Kim SH, Bak KH, Kim DW, Kang TH. Primary intramedullary spinal sarcoma : a case report and review of the current literatures. J Korean Neurosurg Soc. 2010 Nov. 48(5):448-51. [Medline]. [Full Text]. Wang ZY, Sun JJ, Xie JC, Li ZD, Ma CC, Liu B, et al. Comparative analysis on the diagnosis and treatments of multisegment intramedullary spinal cord tumors between the different age groups. Neurosurg Rev. 2011 Aug 6. [Medline]. Lee M, Rezai AR, Abbott R, et al. Intramedullary spinal cord lipomas. J Neurosurg. 1995 Mar. 82(3):394-400. [Medline]. Kothbauer K, Deletis V, Epstein FJ. Intraoperative spinal cord monitoring for intramedullary surgery: an essential adjunct. Pediatr Neurosurg. 1997 May. 26(5):247-54. [Medline]. Cristante L, Herrmann HD. Surgical management of intramedullary spinal cord tumors: functional outcome and sources of morbidity. Neurosurgery. 1994 Jul. 35(1):69-74; discussion 74-6. [Medline]. Jyothirmayi R, Madhavan J, Nair MK, et al. Conservative surgery and radiotherapy in the treatment of spinal cord astrocytoma. J Neurooncol. 1997 Jul. 33(3):205-11. [Medline]. Epstein FJ, Farmer JP, Freed D. Adult intramedullary astrocytomas of the spinal cord. J Neurosurg. 1992 Sep. 77(3):355-9. [Medline]. Epstein FJ, Farmer JP, Freed D. Adult intramedullary spinal cord ependymomas: the result of surgery in 38 patients. J Neurosurg. 1993 Aug. 79(2):204-9. [Medline]. Greenwood J Jr. Surgical removal of intramedullary tumors. J Neurosurg. 1967 Feb. 26(2):276-82. [Medline]. Hoshimaru M, Koyama T, Hashimoto N, et al. Results of microsurgical treatment for intramedullary spinal cord ependymomas: analysis of 36 cases. Neurosurgery. 1999 Feb. 44(2):264-9. [Medline]. Lee M, Epstein FJ, Rezai AR, et al. Nonneoplastic intramedullary spinal cord lesions mimicking tumors. Neurosurgery. 1998 Oct. 43(4):788-94; discussion 794-5. [Medline]. Malis LI. Intramedullary spinal cord tumors. Clin Neurosurg. 1978. 25:512-39. [Medline]. McCormick PC, Torres R, Post KD, et al. Intramedullary ependymoma of the spinal cord. J Neurosurg. 1990 Apr. 72(4):523-32. [Medline]. Ogden, AT and McCormick, PC. Intradural Spinal Tumors. Bernstein, M and Berger, MS. Neuro-oncology: The Essentials. 2. New York: Thieme; 2008. 36: 379-390. Sandler HM, Papadopoulos SM, Thornton AF Jr, et al. Spinal cord astrocytomas: results of therapy. Neurosurgery. 1992 Apr. 30(4):490-3. [Medline]. Stein BM, McCormick PC. Intramedullary neoplasms and vascular malformations. Clin Neurosurg. 1992. 39:361-87. [Medline]. Stein BM, McCormick PC. Spinal intradural tumors. Wilkins RH, Rengachary SS, eds. Neurosurgery. New York, NY: McGraw-Hill; 1996. 1769-89. The first panel shows a cervical syrinx. The differential diagnosis for syrinx includes trauma, Chiari malformation, and dysmerogenesis. A syrinx can also be the by product of a tumor, which may be distant anatomically from the associated syrinx. The second panel shows a small enhancing ependymoma of the thoracic spine that was found during the workup for the cervical syrinx. This is a sagittal image of an enhancing conus medullaris lesion in a 45-year-old man who presented with midline back pain. This hemangioblastoma was removed completely. The patient remains neurologically intact, and imaging of his neuroaxis did not reveal other lesions. This is a sagittal image of an enhancing cord lesion in a 41-year-old man with a rapidly progressing severe quadriparesis. A biopsy showed this to be sarcoidosis. Following treatment with steroids, he is now ambulatory with assistance. The authors and editors of Medscape Reference gratefully acknowledge the contributions of previous author Nicholas Wetjen, MD, to the development and writing of this article.